Remembrance of Krishna is not possible for the impure soul who has not practiced Krishna consciousness in devotional service. 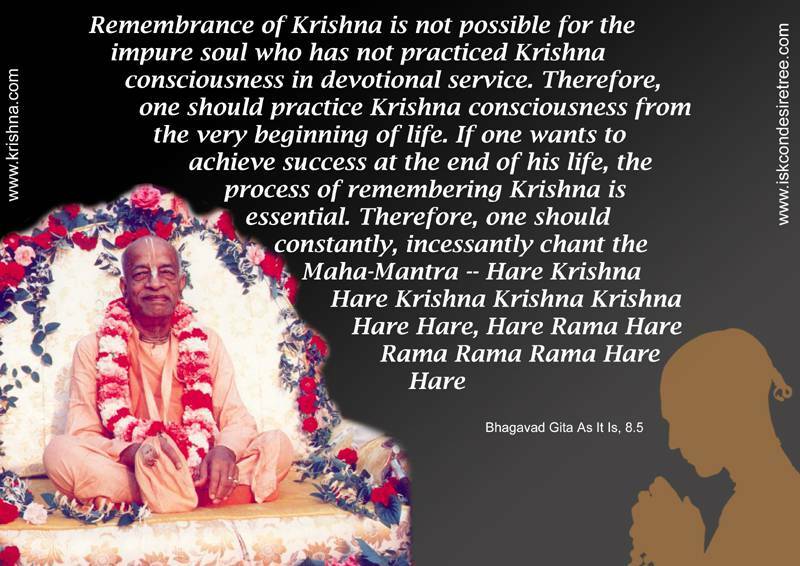 Therefore, one should practice Krishna consciousness from the very beginning of life. If one wants to achieve success at the end of his life, the process of remembering Krishna is essential. Therefore, one should constantly, incessantly chant the Maha-Mantra — Hare Krishna Hare Krishna Krishna Krishna Hare Hare, Hare Rama Hare Rama Rama Rama Hare Hare. — Bhagavad Gita As it is, 08.05. Remembrance of Krishna is not possible for the impure soul who has not practiced Krishna consciousness in devotional service. Therefore, one should practice Krishna consciousness from the very beginning of life. The nectar of Krishna's words and the descriptions of His activities are the life and soul of those suffering in this material world. These narrations, transmitted by learned sages, eradicate one's sinful reactions and bestow good fortune upon whoever hears them. These narrations are broadcast all over the world and are filled with spiritual power. Certainly those who spread the message of Godhead are most munificent.